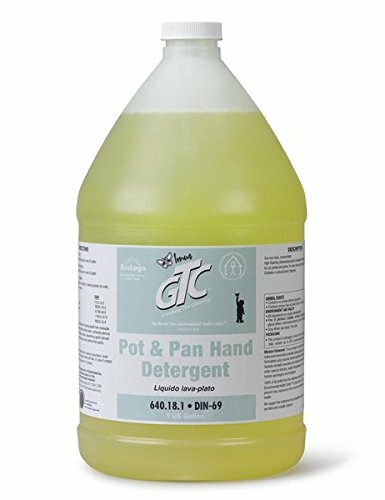 Greening The Cleaning Pot & Pan Hand Detergent is a concentrated high-foaming dishwashing liquid designed to cut through grease and grime. It's easy to rinse and leaves dishes and pots streak-free. NOT for use in automatic dishwashers.For use in kitchen 3-Sink set-ups. Green is a Growing Business Traditional cleaners contain ingredients that are linked to asthma, cancer, reproductive toxicity, hormone disruption and neurotoxicity in addition to skin rashes and burns and eye irritation.To the greatest extent possible, Greening The Cleaning products contain naturally-derived, plant and mineral-based ingredients that deliver the maximum level of efficacy at the lowest level of toxicity. Greening The Cleaning products are never tested on animals and are not formulated with animal-derived ingredients or known human carcinogens, mutagens, teratogens or endocrine disruptors.have been implemented in hospitals, schools, day care centers, government facilities and businesses nationwide.According to the Facility Cleaning Decisions June 2014 Reader Survey, respondents indicated that green products and processes have almost become a 'no-brainer ' with green cleaning product usage increasing 28% over 2013. 74% do whatever they can to incorporate green products into their cleaning program.68% say the most beneficial aspect of using green cleaning products is improved health among building occupants and cleaning workers.The most recent OSHA data from 2010 states that the healthcare industry has more injury and illness cases than any other industry -653,900 annually.Data from 4 states indicates that work-related asthma cases among healthcare workers represented 16% of the total illness number.Work-related asthma cases were 2x greater for employees with exposure to general cleaning products and disinfectants.Respiratory irritation and skin irritation and sensitization are the primary concerns for employees exposed to cleaning products and disinfectants. Great for restaurants, Daycare and School. Green your Business! If you have any questions about this product by Greening The Cleaning, contact us by completing and submitting the form below. If you are looking for a specif part number, please include it with your message.